160 pages | 7 B/W Illus. 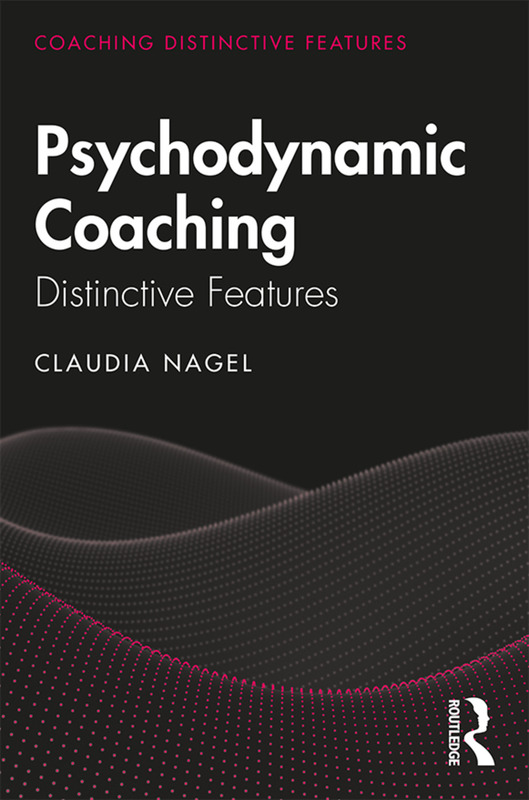 In Psychodynamic Coaching: Distinctive Features, Claudia Nagel presents a comprehensive overview of the unique features of psychodynamic coaching. As leaders and managers acknowledge the need to understand themselves and their context by looking underneath the surface to improve their decision-making, psychodynamic approaches offer unique insight. Psychodynamic Coaching: Distinctive Features covers not only the major theory but also the practice of coaching, giving guidance from beginning to end of the client relationship. Constructive, holistic and accessible, it demonstrates the impact and dynamics of the unconscious whilst illustrating the power of understanding human behaviour in the complexity of the modern world. With a focus on emotions and relationships in supporting modern leaders adapting to organzational challenges, this book will be an invaluable tool for coaches of all backgrounds, academics and students of coaching and organizational behavior and also clinicians. It will also be a key resource for senior leaders for their own personal growth. "With this book, the Publisher has opened a new series on coaching. "Claudia Nagel has written a comprehensive introduction to the practice of psychodynamic coaching. She provides the practitioners and students of coaching with a survey of the most relevant frameworks that shape coaching practice, referencing such classical thinkers as Freud and Jung, while drawing on contemporary thinkers such as Rieman, Panksepp and Long. True to her roots in psychodynamic thinking she highlights the central role that emotion plays not only in the coach’s effectiveness but in the good performance of workers, professionals and managers. She outlines the stages of the emotional encounter between the coach and the client as the coach empathizes, explores and interprets a client’s experience. She demonstrates how the coach moves back and forth between the process of first eliciting and highlighting feelings and then helping the client thoughtfully reflect on these emotions. With her new book on Psychodynamic Coaching, Dr. Claudia Nagel presents a highly valuable compendium to the subject of interpersonal and unconscious realities in organizational behaviour that senior managers and business leaders sometimes notoriously tend to either ignore in a pledge for "plain rationality" or are rather convinced to master anyway. Claudia's work is firmly rooted in latest academic research, yet thoroughly inspired by her extensive practical experience in both, leadership roles in economics and global finance and psychoanalytical client work. Her work is masterful in her synthesis of addressing typical "face value" situations in daily organizational life and tracing it down to the mental predispositions of humans and thus encouraging the reader to reflect on their own undercurrents of the unconscious. In doing so Claudia's work is remarkable for its very thoughtful human approach to the subject and the personality of the coachee. Her perspective embodies a great deal of respect and understanding for the individual, not least the subtleties of the coach-coachee-relationship. Preface; Theory - Part 1: Basic Theory; Chapter 1: The Roots of Psychodynamic Coaching in Psychoanalytic Traditions; Chapter 2: Psychodynamic Coaching Is Not Psychotherapy; Chapter 3: Basic Elements of Psychodynamic Coaching; Chapter 4: Reasons and Occasions for Psychodynamic Coaching; Theory - Part 2: Basic Theoretical Concepts – Relationships as Focus; Chapter 5: The Unconscious as Common Ground: From Soul to Unconscious Cognitions– a historical overview; Chapter 6: Personal Development, Personality and Character in Psychodynamic Coaching; Chapter 7: Human Relationships and the Role of Emotions and Conflict in Professional Life; Chapter 8: Human Relationships and Basic Working Concepts: Transference, Countertransference, Attachment and Defences; Chapter 9: Neuroscientfic Foundations of Human Relationships: New Insights for Psychodynamic Coaching; Chapter 10: The System as Significant Context; Theory - Part 3: Application in Coaching: Using the Relationship; Chapter 11: Understanding the Inner-Landscape: Creating and Transforming Meaning; Chapter 12: Dealing with Different Leadership Types; Chapter 13: Facing Challenges Such as Resistance and Defences; Chapter 14: Working with Defences on the Group and Organisational Level; Chapter 15: Being Aware of Risks and Limitations; Practice - Part 1: Preparing for the Client; Chapter 16: Assumptions for the Coach Regarding the Client; Chapter 17: Assumptions for the Coach Regarding Themselves: Attitude, Perspective and Training; Chapter 18: The General Setting; Chapter 19: Contracting: The Very First Meeting; Practice: Part 2 - Running the Coaching Sessions; Chapter 20: Beginning the Relationship: Ways of Opening; Chapter 21: The Integration of Additional Diagnostic Tools; Chapter 22: Working In and With the Relationship: The Coach as Instrument; Chapter 23: Working at the Core of the Client's Questions; Chapter 24: Dealing with Emotions; Chapter 25: Using Symbols; Chapter 26: Coaching Female Leaders; Chapter 27: Understanding and Addressing the Context; Chapter 28: Coaching Teams in Organisations; Practice: Part 3: Ending the Coaching; Chapter 29: Ending the Coaching Relationship; Chapter 30: Training, Ethics and Elements of Good Practice; References; Index. Dr Claudia Nagel is a consultant, coach, and senior advisor to international corporations and their board members. As an economist, organisational psychologist and chartered psychoanalyst, Claudia is an expert on leadership, strategic management and transformation processes. Deeply respectful of the human side of business, her background in finance and investment banking and experience in different leadership roles make her an invaluable resource for senior leaders.